It is increasingly unlikely that global warming will be kept below an increase of 2C (3.6F) above pre-industrial levels, a study suggests. 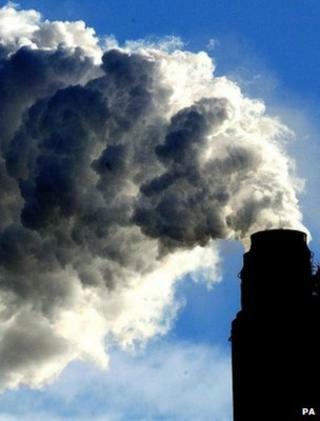 Data show that global CO2 emissions in 2012 hit 35.6bn tonnes, a 2.6% increase from 2011 and 58% above 1990 levels. The researchers say that emissions are the largest contributor to future climate change and a strong indicator of potential future warming. Meanwhile, the data has been published in the journal Earth System Science Data Discussions. Many low-lying nations have used the UN conference, which is currently under way in Doha, to call for a threshold temperature rise less than 2C, arguing that even a 2C rise will jeopardise their future. "These latest figures come amidst climate talks in Doha, but with emissions continuing to grow, it's as if no-one is listening to the scientific community," said Corinne Le Quere, director of the Tyndall Centre for Climate Change Research at the University of East Anglia. "I am worried that the risks of dangerous climate change are too high on our current emissions trajectory," Prof Le Quere said. "We need a radical plan." The researchers' paper says the average increases in global CO2 levels were 1.9% in the 1980s, 1.0% in the 1990 but 3.1% since 2000. Recently, the World Meteorological Organization (WMO) reported that greenhouse gases in the atmosphere hit a new record high in 2011. In its annual Greenhouse Gas Bulletin, the organisation said that carbon dioxide levels reached 391 parts per million in 2011. The report estimated that carbon dioxide (CO2) accounted for 85% of the "radiative forcing" that led to global temperature rises. Other potent greenhouse gases such as methane also recorded new highs, according to the WMO report.